Entièrement mis à jour à l'automne 2013. Profitez d'un condo en bord de mer entièrement rénové avec un hébergement de luxe. Nouvelle cuisine propose des comptoirs en granit, de nouveaux appareils et des armoires personnalisées. Les bains sont mis à jour avec de nouvelles tuiles, de nouvelles armoires et les appareils. Master bain comprend une nouvelle douche de plain-pied. Connexion Wi-Fi est inclus (en copropriété, et pas seulement la version du hall) avec de nouveaux téléviseurs et lecteurs de DVD dans les zones de vie et de sommeil. Very nice, very clean,and well equipped condo. 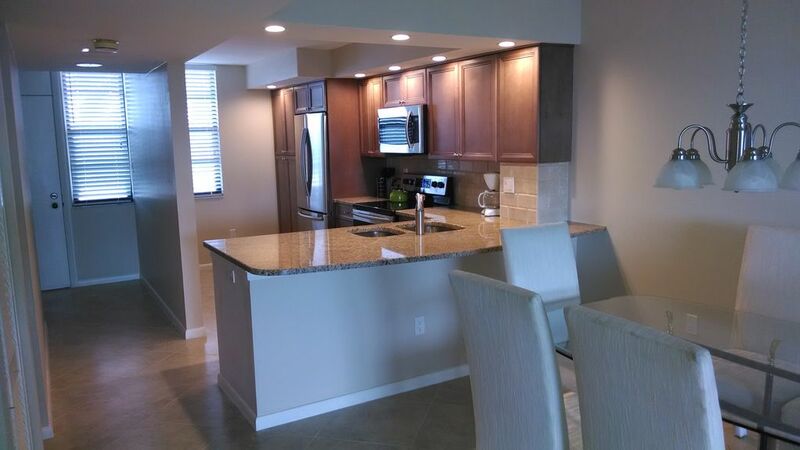 Our overall experience was great, the condo was very nice and the property was impeccable. One thing that would have been a bonus for us would be access to an outdoor grill to barbecue on .but with so many great restaurants so close by it wasn’t a deal breaker! We will definitely be back! My family and I really enjoyed this condo! It was perfect size for 4 people and in a great location. Very safe and well monitored condo with wonderful and helpful office staff and gorgeous beach a few steps away. The owner was so easy to deal with and never hard to get ahold of with any questions we had. We will definitely stay here again on our next trip to Marco Island! This property was nicely updated, clean, and bright, with a great view of the grounds and Gulf. The location is outstanding. The owner was terrific to work with. Communication was timely and always helpful. Would definitely return to this property. We rented this condo over Christmas - NYE week and couldn't have been happier with it. Not only was the condo lovely, completely updated, and easy to use, but Megan's directions were also very clear in terms of how to use the washing machines, get around the premises, etc. I also appreciated the newness of the sheets, towels and bed coverlets. Everything felt fresh and modern. The condo had a good number of plates, glasses and utensils for a rental. It worked perfectly for our family of 4. Access to the pool and the walk to the ocean were both easy. We were sad to leave the condo after a wonderful and relaxing week!